Increasingly, people are looking for words that count people in. 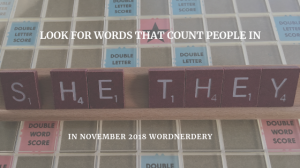 Wordnerdery is a quick once-a-month read about words, effective/expressive writing, newsletters and more. Are you a subscriber yet? If yes, thanks for reading! If not, you can sign up right now. In keeping with Canada’s anti-spam laws and just plain good manners, you can easily unsubscribe any time.